The residents of Faymonville, a small village in Liege, Belgium, have considered themselves Turks for centuries despite being hundreds of kilometers away from Turkey. The village even holds an annual Turkish festival, which attracts thousands of people, especially Turks, from all over Belgium and Europe. This year's festival was held Monday. 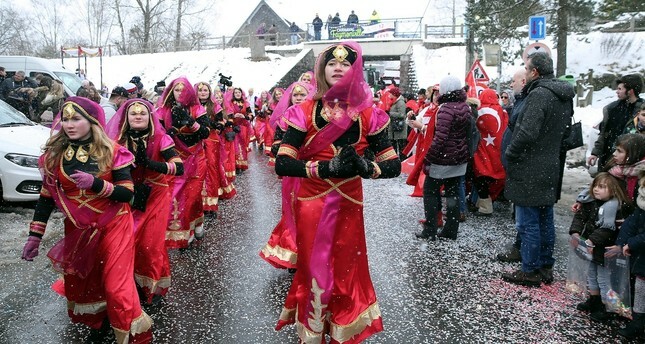 During the Turkish festival, Faymonville's Francophone residents dress up in traditional clothes and carry the Turkish flag on horseback as they march through the streets. The event has caught on with Turks from all around Belgium and the neighboring countries. İsmail Gündoğdu, a long-time participant, said: "The Faymonville Festival is nice as it takes place every year. I have been attending it since 2003. We have Belgian friends here." "We love seeing the Turkish flag wave here. It is good to see so many Turks have come to join the festival." There are numerous references to Turks, the Turkish culture and history in Faymonville. For instance, the only hotel in the village is called "Le Vieux" (Forer Sultan), the building that houses the village library bears a moon and a crescent on a plaque at the entrance and its windows are decorated with Turkish flags. Faymonville's local football team also features the same Turkish influence. Named RFC Turkania (Young Turks Union), the club's crest features the Turkish star and crescent. Located near the country's eastern German border, Faymonville has a population of over 1,000, of who none are Turkish descendants. There are different accounts, dating back as far as the eighth century, as to why the residents are called Turks. According to one claim, Faymonville's residents rejected taking part in the medieval Crusades raised against Muslim Turks. A different account claims that Faymonville was called a "Turkish village" after its residents refused to pay Church-imposed taxes to finance a war against the Ottoman Turks.